Protect your kitchen walls from unwanted stains with a Splashback. The best cooks are messy, right? Well avoid stain drain with the modern way to keep your kitchen clean. Remove spills and marks created by cooking by easily installing a KuKoo splashback. Splashbacks offer a hygienic alternative to bare walls, producing an easy to wipe surface that will shave minutes from your kitchen cleaning. 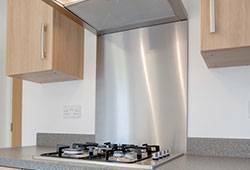 Our hob splashbacks are affordable, with a slick, contemporary appearance and are supplied non branded to fit seamlessly into the decor of any kitchen. Exclusively designed (but not limited to) for our cutting edge KuKoo cooker hoods, all of our cooker splashbacks are available with free delivery, or can be picked up from our North Yorkshire home near York.